The ‘most beautiful marathon in Britain’ keeps runners coming back. Kielder Marathon in Kielder Water & Forest Park, Northumberland returns for the fifth time on Sunday October 5, 2014 with a string of repeat competitors. Home to the majestic Kielder Water – northern Europe’s largest man-made lake, and the world’s fourth largest Dark Sky Park thanks to minimal light pollution, the home of Kielder Marathon helps to maintain its long running title billed as ‘Britain’s most beautiful’. Runner Alison Wolstenholme (pictured above), aged 49, from Accrington in Lancashire, has been drawn back 150 miles to the stunning venue every year since the marathon started. But, she recalled, it almost didn’t happen. “On the event website, I’d pressed a button thinking that I was just getting a bit more information about it, but I’d actually entered myself in the marathon accidentally! “I cycled around the route to see what I was getting myself in for and that’s when I thought I’d bitten off more than I could chew. I stuck with the training though and completed the marathon and that was the start of my love for the location and the race - I’ve run every Kielder Marathon ever since. Alison, who is a member of Accrington Road Runners running club, crossed the finish line in 5 hours 14 minutes in 2010 and works to better her time every year. Hugely successful and popular with outdoor adventure enthusiasts around the UK and further afield, Kielder marathon follows an off-road route around Northumbrian Water’s Kielder Reservoir. At 26.2 miles long it is the ideal venue for the ultimate running challenge and event organisers are expecting up to 2,000 runners to take part in the weekend of events. 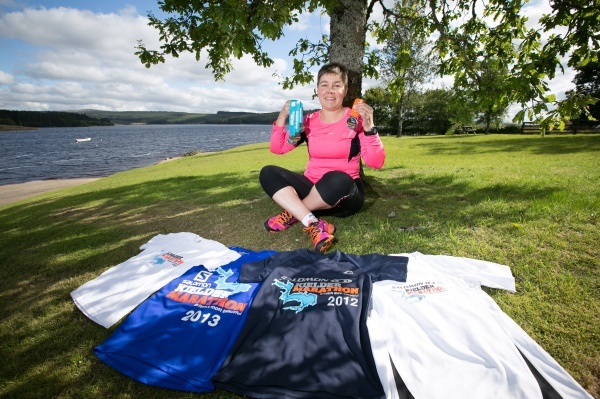 Another Kielder Marathon regular, Stefania Williams, 48, from Woolsington Gardens, Newcastle, said: “I’ve always loved running and the location of Kielder, so to take part in the first marathon there seemed very fitting. This year the marathon returns with new headline sponsors, Active Northumberland and Northumberland County Council. Race Director and world record holder Steve Cram, said: “Five years on, Kielder Marathon is going from strength to strength and I’m delighted that we continue to draw in our ever presents - runners who have been with us since the inaugural event. The marathon will start and finish at Northumbrian Water’s Leaplish Waterside Park and be part of a whole weekend of activities for all ages and abilities, including the Kielder 10K which takes place on Saturday October 4. The other events are Kielder Run Bike Run relay and the Kielder Junior Races for children. To book a place log on to the event website at www.kieldermarathon.com. For enquiries telephone 0845 155 0236 (Monday to Friday, 9am – 5pm). For individuals or teams of three – the marathon route in three stages. First, an 11k run, second a 26km cycle ride and finally 5km sprint.